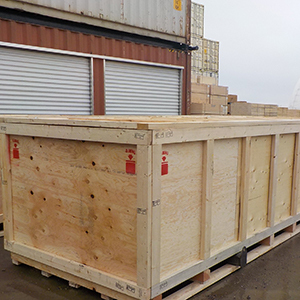 Custom Crating | Sea-Can Containers Ltd. Experts in custom crating solutions since 1976, Sea-Can Containers can product the custom shipping crate that fits your needs. 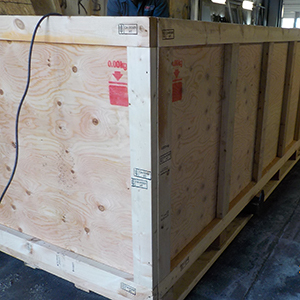 Our resilient custom designs ensure wooden shipping boxes will properly fit with maximum protection for any size product. Sea-Can’s wooden collapsible containers are TDG approved for transporting solid waste. Available features include: Customized interiors, hinged lids, latched doors, separate compartments, and more. These crates can be customized in almost any way to meet your needs. 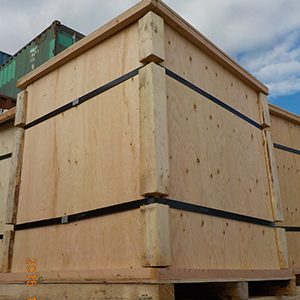 We have manufactured crates in lengths ranging from 50 feet to 6 inches. Since 1976, Sea-Can Containers has been manufacturing collapsible containers that are Transport Canada Approved, United Nations Approved, and ISO 9001:2008 certified. These containers are also TDG approved for hauling solid waste. This collapsible wooden container is the perfect solution to many problems in shipping. It is especially useful for hazardous material transport, for marine transport, and for storage in remote locations. The container keeps goods safe and dry even in Arctic conditions. Used for packaging all types of chemicals, contaminated soils, heavy products, drilling mud, cements. Can also be supplied with and OR RPE 25 liner (designed for contaminated Soil, PCB’s, etc. For companies doing business in the Arctic, what gets shipped in, must get shipped out. The Sea-Can is collapsable to reduce empty shipping volume. It is easily disassembled and components used in other applications. Since the Sea-Can is mostly constructed of wood they can also be recycled. Because crated contents are difficult to load and unload from above, sometimes it is just easier to have level access to equipment or cargo. Sea-Can Containers’ seacan’s have a sturdy platform for level access and the sides and lid easy to remove without damaging cargo. Since Drilling Chemicals need to be properly packaged for transport, and have to be kept dry on-site, Sea-Can Containers has a solution. The 4 ft. Sea-Can is a popular solution for packaging and transporting drilling chemicals. Once drilling chemicals have been packaged in a Sea-Can they can be easily transported by Truck or Barge. Fully loaded Sea-Can’s can be stacked 3 high to save yard space.The Sea-Can is very weather resistant and will keep drilling chemical dry in arctic conditions for years. Products such as Agroforestry crops and geological samples need to be crated in a remote location. The Sea-Can is can be assembled on remote sites using ratchet strap/tie-downs instead of steel banding. This reduces the cost of transporting empty containers to the site. Once assembled the Sea-Can is sturdy enough to be re-used.